The Silver Scarab must be found before the day is over. Click here to play! There is too much at stake to pass this quest up, so head on down to this exciting slot for incredible cash payouts! 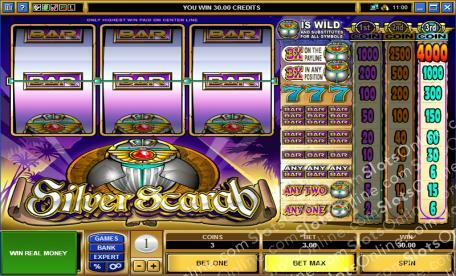 Silver Scarab is a thrilling slot played across three reels and a single pay line. There are three coins available to be played on each spin, with different payouts for each winning combo depending on how many you use. The Silver Scarab is Wild and can be subbed for any other symbol, and it is also Scattered and can appear anywhere on the reels to generate a payout. If you wager a single coin and win the jackpot, you will receive 1000 times your bet, but if you wager three coins and win, you will earn yourself 4000 coins! Join the race to find the Silver Scarab before it's too late, and start playing this riveting slot today! Silver Scarabs are Scattered and can appear anywhere on the reels in order to receive a payout. The Silver Scarab is Wild and can become any other symbol on the reels in order to compelte winning combinations.